I grew up in Boston, Lincolnshire, the eldest of four sisters in a very small house. My entire family read books like starving wolves eat their dinners, reading was my first great escape. The second was St Andrew's University. 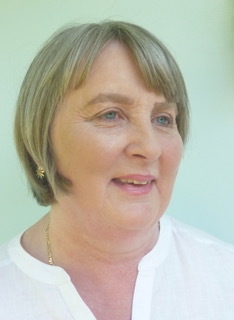 After a variety of jobs I settled down in Derbyshire to write books, which has just about kept the show on the bumpy road these last twenty-five years or so. Every few months, when the books in my home are heaped too high, horizontal above the vertical in the bookcases, sprawled across too many tables, at avalanching point on my desk, I have a cull. A horrible cull. I have to be in a bad-tempered, planet-saving, if-I-don’t-do-this-who-will mood to manage it, but it happens. A year or two ago, Fräulein Schmidt was one of the victims. It was time. Her glue no longer held her together: her pages were yellow, and even worse, loose. She was quietly biodegrading, the tattiest of all my tatty green covered Viragos, and so off she went, too shabby for a charity shop, straight into paper recycling with the cereal boxes and bills. I lasted about six months without her, before I went out and tracked down a replacement. I would like Fräulein Schmidt to live next door to me and come round often and borrow my books and lend me hers, and make me laugh and gather up my courage on dark days and rush outside with her on bright ones to appreciate the lovely, ludicrous, luminous corner of the planet in which we find ourselves planted. She is a heroine with a talent for friendship, she is one of those people you find in books who instantly make you feel better without making you feel needy. She is, if you ask me, but no one ever does, because it is one of the books I have never been able to get another soul to read, the very best of Elizabeth von Arnim. 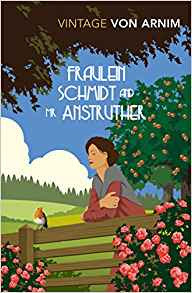 Fräulein Schmidt is Rose-Marie, aged 25 at the start of the book, which is an epistolatory novel, all the letters being from Rose-Marie to the eponymous Mr Anstruther. Rose-Marie lives in a small, dull German town named Jena. Her mother is dead, her step-mother is dour and sour, her father is a professor and he suits Rose-Marie very well. He has a twinkle and a very nice way with words, and they love each other, but he does pipe on, as she says herself, rather too much about Goethe. And he never seems to earn anything in the way of money. Therefore, to make ends meet, the family take in rich English students who wish to learn German. Mr Anstruther is one of them, and one Tuesday night, at end of his year in Jena, Mr Anstruther kisses Rose-Marie. We have to believe, given Rose-Marie’s honesty, that she didn’t hear wrong. This is the unexaggerated truth. She heard it, and for a few breathless chapters, she believed it. Illness follows, and the further disasters, and suddenly Rose-Marie is no longer in Jena, but half way up a mountain, a good long walk out of town, with no one but her father and Joanna, their rambunctious maid, for company, and nothing but her own resources to save her from despair. This is where the story really takes off. She does sympathise, but not always, and not very much. He is so ludicrously privileged and so ridiculously sorry for himself. He cannot resist pronouncing on her world. Joanna’s wages, for instance, shock him completely. The amount Joanna earns in a year, he says, wouldn’t keep him in gloves and ties for a month. Which does not console him at all. This book delights me. It comforts me over and over. I like so much the humanity and courage and brains of Rose-Marie (who between all her other endeavours is busily writing a book, and making a very good job of it). I love how she make friends with little Vicki, who arrives to live next door with a broken heart and is brilliantly engineered into happiness. I admire her warmth. I especially pleased to see the unworthy Mr Anstruther finally brought to his expensively tailored knees. There is so much in this book to love, so many instant character sketches, so many turns of phrase, so many moments of clear sight, and jokes, and triumphs. 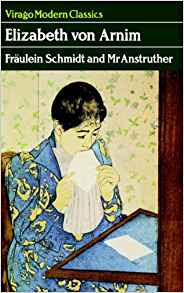 Fräulein Schmidt and Mr Anstruther is published by Virago. Well after this Hillary I will just have to go out and find a copy. I(and add to my own growing, toppling bookpiles) It sounds marvellous! And I haven't read The Enchanted April either. So lots in store. Thank you for this! I've read other books of hers but not this one. I didn't even know it existed but it has now gone to the top of my must-have pile. Thank you! I'm reading it now, Hilary. Thanks for the recommendation!